Ballyclare Comrades manager Clifford Adams. 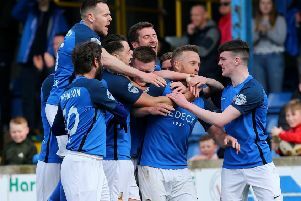 Ballyclare Comrades bounced back from going a goal - and man - down at Shamrock Park as Stewart Nixon’s double secured a memorable extra-time success over Portadown. Both clubs suffered a red card over a fifth-round Tennent’s Irish Cup tie which produced plenty of talking points. Chris Lavery and Gary Warwick linked up to carve out an early Portadown opening along the left as the former’s cross to the back post was diverted back by the latter but supporting David McCullough struggled to gain a clean connection. Patient approach play led to Adam Salley whipping over a cross but Warwick, in space in the heart of the penalty area, could only steer his sidefoot shot over the target. Warwick then played a key role in Portadown breaking the deadlock when, on 27 minutes, he fired in a low cross which centre-back Adam McCallum drilled home. Salley then slipped a pass behind the Comrades backline and McCullough managed to move around the advancing Paddy Flood but the visitors recovered to cut out the threat. Comrades survived a penalty shout - despite the appearance of handball - but suffered a red card on 39 minutes following Samuel McIlveen’s challenge on Andy Kilmartin. Portadown’s pressure before the break continued with Salley heading over off Lavery’s cross then the latter racing to collect a Kyle McVey pass but Flood diverted away the danger with an out-stretched leg. However, a second-half glancing header from Curtis Woods off Chris Middleton’s free-kick served as warning of the away side’s threat at such a slender lead - and, on 57 minutes, Comrades left it level. The impressive Adam Gray attacked at pace, twisting and turning before slipping the ball for an unmarked Nixon to slot home with a clever finish. Portadown struggled to regain the initiative and 10-man Comrades posed the greater attacking threat after the interval as John Dobbin and Nixon tested Chris McGaughey. Fra Brennan’s afternoon was cut short before extra-time with a red card for the defender following his second bookable offence. Salley sent Lavery clear early in extra-time but the winger’s shot lacked convinction and Flood produced the save. The Comrades goalkeeper pulled off a fine save in the second half of extra-time to stop Lavery’s low drive - but Ballyclare produced the decisive moment to march on thanks to Nixon’s finish with 90 seconds left on the clock. PORTADOWN: McGaughey, N.Henderson, Brennan, McCallum, McVey, Kilmartin, McCullough (Wilson, 61), Warwick (Neill, 90), Lavery, Salley, D.Henderson (Balde, 74). Subs (not used): Hall, Duffin. BALLYCLARE COMRADES: Flood, Youle, Rodgers, Woods, Gray (McWilliams, 109), Parker, Dobbin, McIlveen, Middleton (Robinson, 94), Nixon, Kelly (Dugan, 77). Subs (not used): McCart, Johnston.